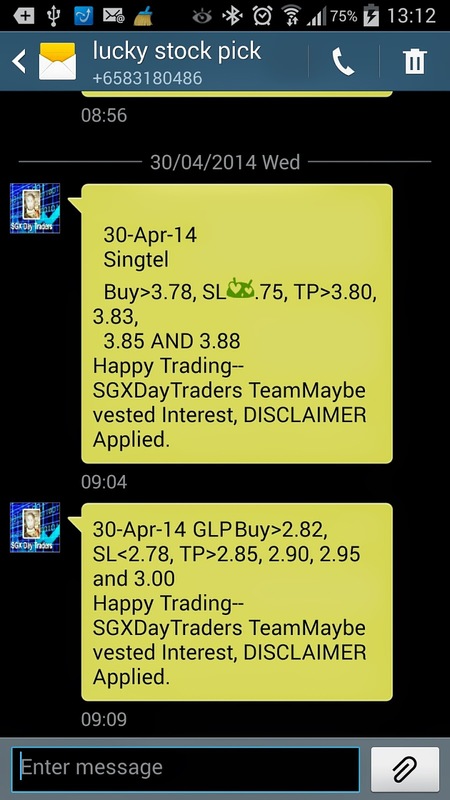 SGX Day Traders started Live Trading Calls via Live Trading Webinar (official Launch on 17 Feb 2014) and Live Trading SMS services (Officially Launch on 22nd Apr 2014. ), Time flies and we have passed 2 and Half months. Below is our up to date Lucky Stock Picks performance. If you interested our services, May fill this contact us form here. 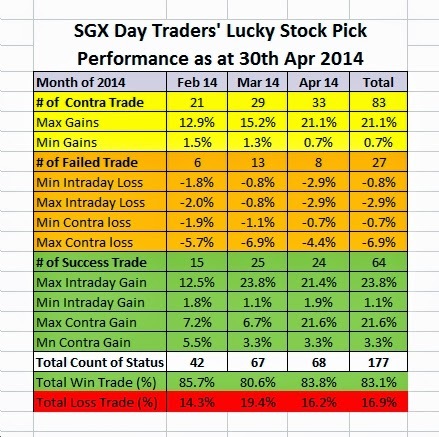 SGX Day Traders provide two services now. Live trading SMS services-- turn our hard work into your profit. Our Buy & Sell Strategies---We only focus on low risk setups when stalking trades. We are very picky and we won't call something unless the chart offers a clean entry with a tight stop. Live Trading Webinar--Trade with veteran Full-time traders, See our Trading screen and ask Questions when market is live. Our veteran traders will shares the market’s outlook and suggest strategies for Singapore stock market before the market opens at 830am and 230pm for 15 minutes each debrief. The daily stock pick list will be shared and when a counter near trigger will usually prompted in the webinar. Here is the sample of our SMS Services. Here is the sample of our Live trading Webinar.